I always advocate for looking at a storied director's early work. Spielberg's made-for-television thriller Duel, for example. Christopher Nolan's efficient, moody little feature Following is good, too. Here we have Francis Ford Coppola, the auteur behind 1970s epics that have become cultural keystones, debuting as writer and director of a European gothic throwback horror, made on the cheap in nine days, with a nine-person crew. 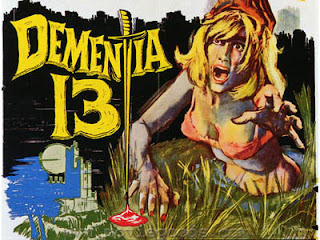 Remembered mostly through the lens of "early work," Dementia 13 has surprising staying power for a very familiar take on the foggy moors, family inheritance, buried secrets, haunted mansion tropes dripping from the script. It's a quick, breezy film that tells a fully realized story and leaves a lasting impression with a few key visuals. Famously, Roger Corman would squeeze every last cent out of a film, and when working on 1963's The Young Racers he found he had an extra $20,000 to goof off with. Doubling as an act of generosity and extreme cheapskate-ism, Corman elected to hand the money over to Coppola to make a little quick B-feature with the cast of The Young Racers in only a handful of days. The resulting film does feel that rushed, too. Coppola winds together one of those traditional sordid wealthy family sagas of jealousy, repression, trauma, and eventually murder with the more wibbly-wobbly structure of Hitchcock's Psycho. The dialogue is purely utilitarian, only included to propel the story further and provide a loose context to the atmospheric death scenes. The story, though incredibly obvious and cobbled together from well-worn territory, is somehow also a bit enigmatic and hard to follow in spots. We never exactly land on a protagonist for more than ten or fifteen minutes, jumping from one point of view to another like a novel with an ensemble of antiheroes. The narrative presents a very straightforward story for genre fans, but also dusts the rising action of Act II with details and character beats that hint at the possibility of so many red herrings that seem so plausible in the moment. It's a very simple structure that just happens to work. It's a parlor game. Real promise and spirit comes in the form of the bloody attack sequences, which suggest an inventive, keen eye for visual tension. Most famous of these is the pond attack featuring Luana Anders surfacing in the water right at the feet of the shadowy axe-murderer. The scene features no dialogue, and could be used as a perfect example for storyboarding scenes and narrative photography. And though not actually conscripted for Dementia 13 originally, I do have to praise William Campbell, Patrick Magee, and Anders for their performances. While it's plain the film only promises some naughty underwear scenes and a healthy dose of fake blood, there's something magnetic about Campbell as the often suspicious and not entirely knowable older brother character. Magee steps in late in the film as a wily family physician, and with his very deliberate line readings anchors the story in its major themes with little time to spare. While the stark outlines of filmmaking prowess are few and far between, I think most would agree that owes little to Coppola's lack of experience and more to his lack of time, guidance, or money. A shockingly competent and unexpectedly engrossing public domain mainstay, Dementia 13 is rightly paired alongside Night of the Living Dead as another important document in pop cinema that warrants a close inspection to plot the course of influence and inspiration. It's also only 75 minutes or so, which is well worth it.